Are You trying to find new car dealerships near me in Indiana that have a diverse selection of new cars for sale? Then you need to come to Acra Chrysler Dodge Ram Jeep. At Acra Automotive Group, you will find new cars, trucks, minivans, and SUVs in top manufacturer brands including Chrysler, Dodge, Jeep, and Ram. With such a great variety it has never been easier to compare a variety of new vehicles and find just the one you are looking for at Acra Automotive Group. You will find that our new cars for sale come with some outstanding comfort and convenience features. You can find new cars for sale equipped with power windows, power door locks with remote keyless entry, and cruise control. You can even find new cars for sale with leather seats, Bluetooth cell phone hookup, steering wheel controls, and a rear backup camera. A rear backup camera is not only a great safety feature to help avoid accidents. It also makes backing into and out of tight parking spots easier than ever. Bluetooth Connection is a great feature to have because it allows you to make and receive phone calls without you ever needing to take your eyes off of the road. You can keep your hands safely on the wheel if you choose a new car with steering wheel controls because you can set, accelerate, and cancel your cruise control or work your radio controls right at your fingertips. Seating options are also a choice. Pile in up to six people when you choose a truck that comes equipped with a front split bench seat! Or even more when you choose a minivan or used SUV with 3rd-row seating. We want you to drive away with a smile on your face and not doubt in mind that you will be driving home in a new car for sale that is going to not only fit you and your families needs but your budget as well. If a new minivan is in your future, check out a new Chrysler Pacifica. Like the new Chrysler Pacifica Touring-L for sale. New minivans for sale like this Pacifica come with many features both inside and out that you will not want to miss. This new minivan for sale comes with heated leather seats and a leather wrapped steering wheel. This new minivan for sale also comes with steering wheel controls. This allows you can change the radio station and turn the volume up or down without ever taking your hands off the wheel. This new minivan for sale also comes with wireless cell phone hookup for easy hands-free calling. Still looking for more? You will also find that this new minivan for sale comes with a power rear hatch. This feature allows you to have easy access to the rear cargo area without the need to empty your hands to get to it. The new Chrysler Pacifica minivan for sale also comes with a built-in backup camera with color-coded grid lines. Now getting into and out of even the smallest of spots will be a breeze. This new Chrysler Pacifica has multi-zone climate control. Now you and your passenger can be at the ideal temperature no matter how hot or cold that may be. This new Chrysler Pacifica for sale is ready to take on all of your driving needs. Whether it is going to and from work every day, running errands around town, or picking up the kids. Come to your local new car dealership near me in Greensburg IN of Acra Chrysler Dodge Ram Jeep and see the impressive new Chrysler Pacifica minivan for sale today. 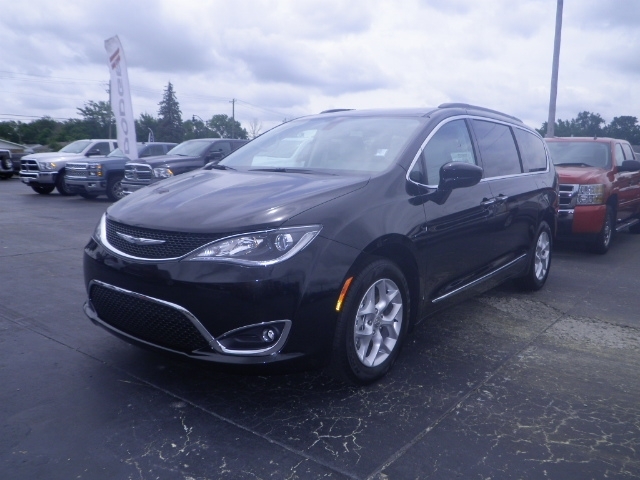 Whether you are looking for new minivans for sale at car dealerships near me in Greensburg IN like the new Chrysler Pacifica or another type of new vehicle, you are sure to find just what you are looking for here at the car dealerships near me of Acra Automotive Group. Come and take one of the many new minivans for sale on a test drive. When you are wondering where to find a diverse selection of new cars , trucks, SUVs, or new minivans for sale at new car dealerships near me, the only Greensburg IN dealership you need is Acra Chrysler Dodge Ram Jeep. Proudly serving the areas of Greensburg, Columbus, Shelbyville, and other nearby Indianapolis areas, Acra Auto Group strives to be your one-stop shopping experience for your next new vehicle. We want you to enjoy a stress-free environment when you come to our new car dealership in Greensburg IN. Our friendly and knowledgeable sales team members are happy to answer any questions you may have about our new minivans for sale to get you one step closer to driving home in your dream vehicle today. You can contact Acra Chrysler Dodge Ram Jeep at 888-604-2722 or come to 1407 North Lincoln Street in Greensburg, Indiana 47240. Are you looking for something pre-owned instead? You can contact the Acra Pre-Owned Superstore in Columbus at 888-356-2272 or visit us at 2820 North National Road, Columbus, Indiana 47201. Acra BuyRite Auto can be reached by calling 877-925-2272 or visit us at 920 North Michigan Avenue, Greensburg, Indiana 47240. Our Shelbyville used car dealership is an Acra Pre-Owned SuperStore and can be reached at 888-318-2272. Or, feel free to stop in at 1200 East State Road 44, Shelbyville, Indiana 46176.